Many girls dream of an ideal wedding and of course the perfect groom to live with for the rest of their lives. Even in this modern generation of questionable morality most of women I know still believe in getting married and having one man to share their life with. But in getting married you’ll have to be prepared with enough finances for all the expenses that go with it. I and hubby experienced that when we get married 13 years ago. Couples would have to prepare everything like guests list, wedding gowns and suits, sponsors, reception, food, music and wedding invitations. We made our own layout of our invitations because I wanted a personal touch and to prevent misspelled names and words. I want my invitation to be perfect and personalized that’s why I made it myself in my computer. I just have it printed in printing press to emboss the printouts. Until now when we read and browse back our wedding invitation we’re happy that it’s our own personalized invitation. 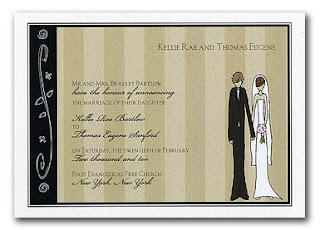 Now you can have your wedding invitations customized without so much fuss as you can order it online. That’s the gift of modern technology and for the couples it’ll be more convenient and affordable too! I’m sure it will make your big day more special. in some ways things have got easier to do for weddings thanks to technology.. however the expectations in many cases have also gone up in what a wedding should be like.